Welcome to Camp Gan Israel, the largest and fastest growing network of Jewish camps in the world. Gan Israel camps enjoy a well-earned reputation as a trendsetter with innovative ideas, creative programs, and new activities. Many a child has been known to wait all year to come back to Gan Israel! Gan Israel is much more than a break from the school routine. It is a comprehensive program, designed to strengthen the body and soul. We provide your child with a rich and wholesome summer of fun and excitement, in a warm and spirited atmosphere, where they will develop friendships and have meaningful educational experiences. We have put together awesome activities for your children to participate in this summer! Mark your calendars for June 17th-28th and Register Today to save a place for your child(ren). Staff - The real secret to our success lies in our outstanding staff. Our counselors, each of whom has prior camp experience are chosen from across the globe for their warmth and ability to understand and care for each child. As a positive role model for your child, they’ll cultivate a friendship that lasts forever. Sports & Swimming - Supervised by our staff through patience and encouragement, children develop sportsmanship, confidence, and the ability to enjoy all sports and recreational activities. All aquatic activities are under the careful supervision of experienced and certified lifeguards at Buchner Pool in Waukesha. Safety is our primary concern. Trips -Daily trip feature excursions to children’s favorites that include Bowling, Adventure Rock, Little-A-Merrick-A, and more! Clubs - Campers can custom design a part of the program by choosing from a variety of clubs. These are accompanied by instructors who will capture their imagination and enhance their skills. Samples of Clubs being offered this year are Jewelry Making, Cupcake Decorating, Zumba, Woodworking, Martial Arts. Art – Self expression and personal creativity are the goals of our art program. Camp Gan Israel’s innovative arts and crafts counselors encourage children’s natural creativity and imagination. Jewish Pride - Exciting hands-on activities, stories, games, challah baking, contests, and Shabbat parties are all part of the unique Gan Izzy experience. There is never a dull moment at CGI, as Judaism is brought to life by art, cooking, and dress up days. 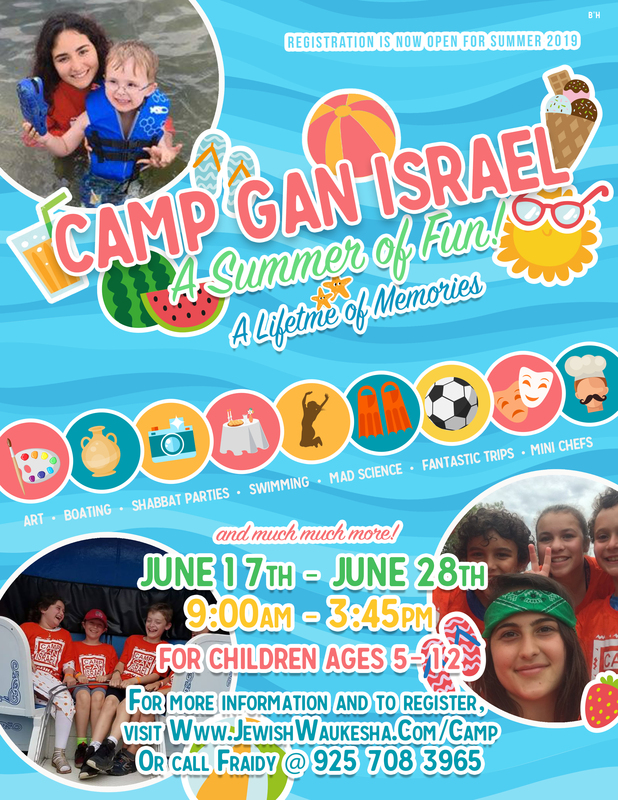 Special Events - Special events are scheduled throughout camp including Talent Shows, Auction Days, Late Nights, and Family Shabbat Dinner &amp; Performance.